Following huge interest last year Give Golf a Go is back for 2019! 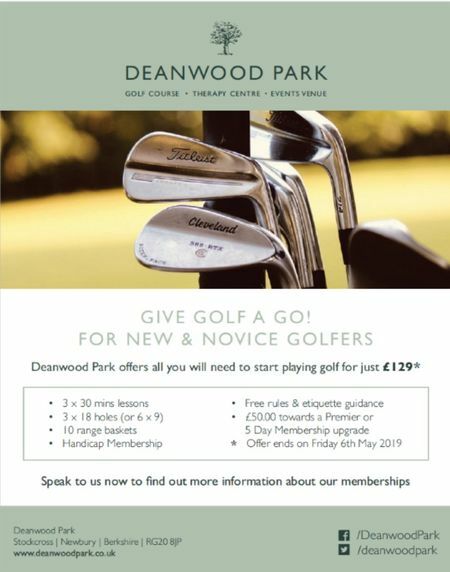 The full value of the package above is around £280 and Deanwood really is the ideal place to learn the game of golf. Simply fill in the application form available below and book your first lesson with Nigel Hart, our PGA Professional. Your Membership details and the rest of your package will be sent to you in the post. The theory is you use your lessons to sort out the basics and decide if you need further tuition or you may be ready to venture onto the course. If you need course guidance we are here to help and possibly find people in a similar position if you need playing partners. The 10 baskets of range balls should allow you to practice what you learn from Nigel. You can either venture out over just 9 holes or jump straight in with 18 and when you are ready we will explain the handicap system and where you can take your golf over the coming months. Either myself (John Bowness - General Manager) or Nigel will offer ongoing guidance with all aspects of the game including rules & etiquette. Deanwood boasts a number of different groups that welcome new players and the friendly atmosphere makes meeting new people very easy.